“Out comes the goalkeeper [Rinat Dasaev no less]. Nat too sure this time. And it’s a goal! Terry Moore taking the credit for that” – Northern Irish commentator (1988) commenting on the night Glentoran were 1-0 up and just a goal away from taking the mighty Spartak Moscow to extra time in Belfast City. My journey is deeply deeply emotional my friends, it’s tainted with sadness with every step I take and as I write this a few weeks on, I only have happy memories but I still cry. These memories are tinged with that feeling on leaving a certain place, that, for the time we get on this planet, we may never return to. I definitely shed a tear when we drove away from the Takht e Rostam Buddhist Monastery in Samangan, Afghanistan. You see, I don’t really play football anymore, a combination of a broken leg, a broken arm and my nights down the pub put paid to that avenue of pleasure or business. My last proper 11 a side official match was in 1999 for 10th Bangor Old boys, some three decades ago. But I had a load of kickabouts on my backpacking journeys in Bournemouth, Australia, Hong Kong, Brazil, Iran and Azerbaijan. Here in 2016, I was sure I’d lost my energy and almost certain to have lost my touch and pace. But I was buoyant and youthful as I backpacked my way through Afghanistan. A rural trip with Noor, Reza and Sakhi took me to the little known town of Haibak, in Samangan where we had Pilov for lunch. 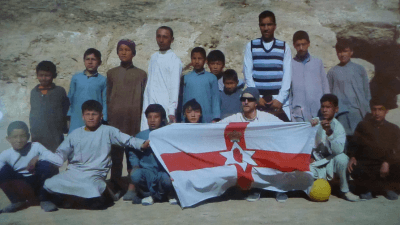 However late morning after touring the Buddhist ruins, there was one Northern Irishman on the pitch in this little ventured part of Afghanistan. It was here on the edge of Haibak in Samangan Province that we visited a somewhat special Buddhist Monastery, Takht e Rostam (report to follow). It was a sunny Saturday morning and the lads were out. It was the weekend, school was out. 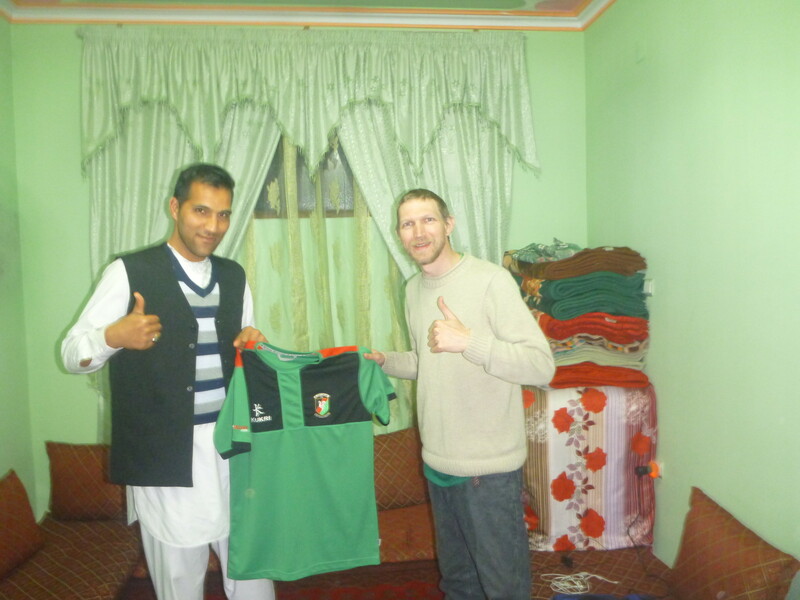 It was football day and my new Afghan friend Reza had a special match in store for us. 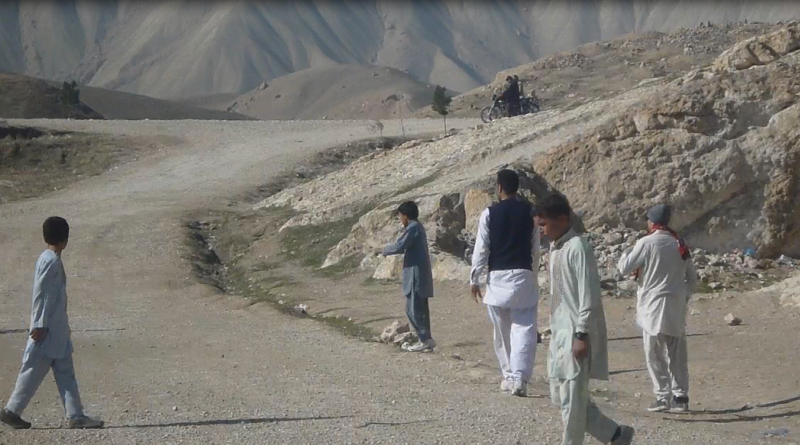 “Do you want to play football?” – said Reza to me. [no brainer] “Too right” I replied and the game kicked off. 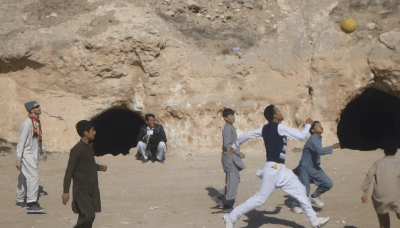 For the first time in my life, playing football was more important than seeing the monastery and though I had a local guide taking me through the old bazaar and the caves, I just wanted to be 8 years old again and play football down the park. Rocks for goalposts, about 8 a side and we played football right next to this ancient Buddhist Monastery. In front of about 10 spectators and my mate and guide Noor taking photos and videos. Reza and I were on opposite teams to make things fair as we were the oldest players there. Reza, a former under 19 international for Afghanistan and he played out in Dubai (UAE) for Al Ahly. In fact if Glentoran FC are reading this – please sign my mate Reza for the Glens at the Oval. He’s class. The next Glenn Little! Reza was the star of the show, time and time again breaking through the defence, deft wee flicks and moves that the likes of Messi and Suarez are notorious for. At one point (on the video at the bottom) he does a virtuoso run which almost resulted in the game’s opening goal. 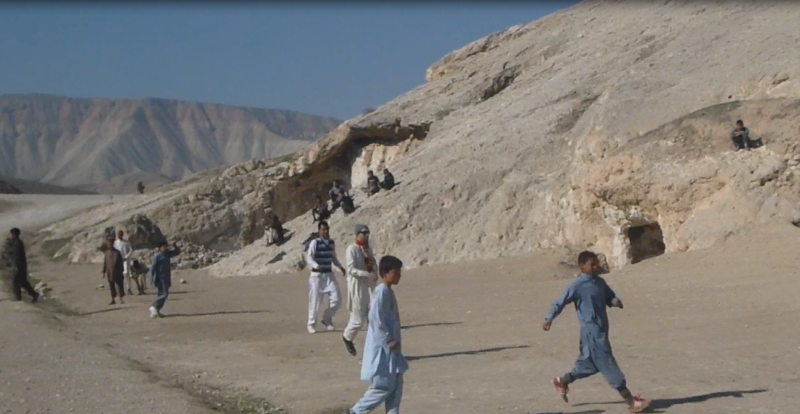 Despite Reza’s skills, the Afghan kids didn’t seem to play football on the ground the way my teams Northern Ireland and AFC Bournemouth do. It was a kind of hit and hope type game. But this got me thinking about long ball games and lofting it. A change in tactic and I decided to have a few long range shots. I was trying to catch the goalkeeper off his line. 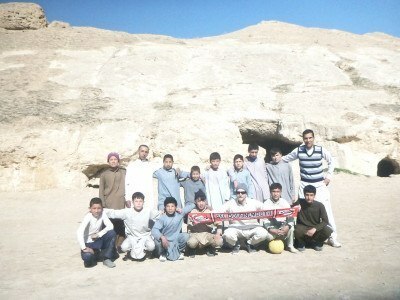 The ball goes into the Buddhist Cave and it’s a throw in to my team. My Afghan team-mate throws it to me, I control it rather badly on the bounce with my left but lined it up “Matt le Tissier style” on my right and fired a 30 yard lob against the goalkeeper. The score was 0-0 as I launched a Nayim from the half way line. But the goalkeeper reached back and caught it on the line. I didn’t score. My shot had been on target and was a decent effort though and I was pretty happy. I had tried, but I hadn’t scored in Afghanistan. Just after this, twice Reza almost broke the deadlock with a few darting runs. I tried another long ranger on the ground just before the hot sun began to fade and the local Afghan kids had to call time on the match. There was no “goal the winner”, the match finished 0-0 without the need for a pelanty shoot-out. 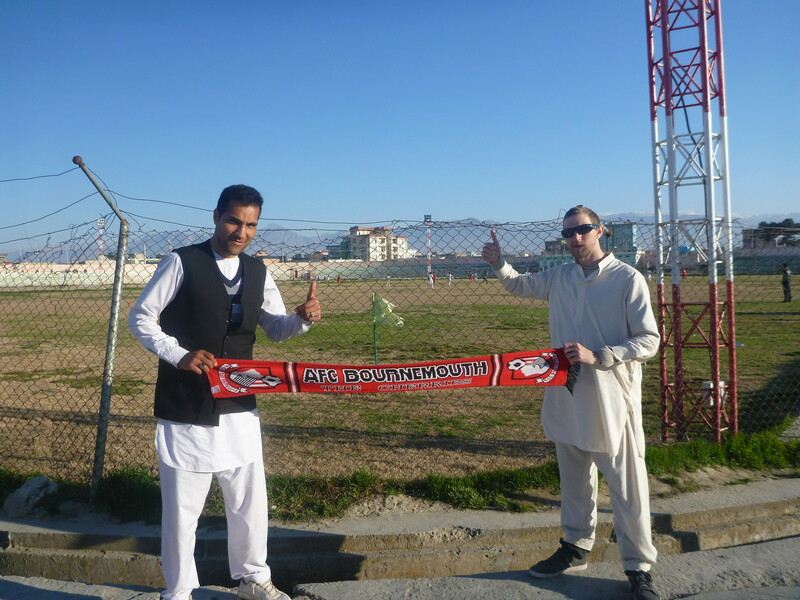 It was hot and sweaty out there and I played wearing my AFC Bournemouth scarf, a hat and my Afghan clothes. We posed for photos with the Afghan children and continued our tour. My moment of glory was over and I wasn’t the hero of the day, but I loved it and it’s a moment I won’t forget. To play with these kids outside a Buddhist monastery was special, to even get a shot on goal was fab. We wished we could play there every week of course, but life is not like this. I knew it was a on off and as I waved goodbye to the children and we drove back to the town of Haibak, I felt a hint of sad emotion. I hope these Afghan children find their freedom, for eternity. I’ve passed back the photos to Reza and Noor and hopefully the kids can see them. And maybe, I’ll be back again someday. 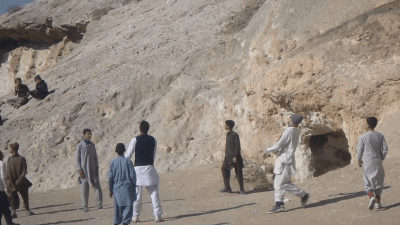 While backpacking in Afghanistan, I also watched a local football match at the Sina Stadium in Masar e Sharif and enjoyed Buzkashi, the national sport. 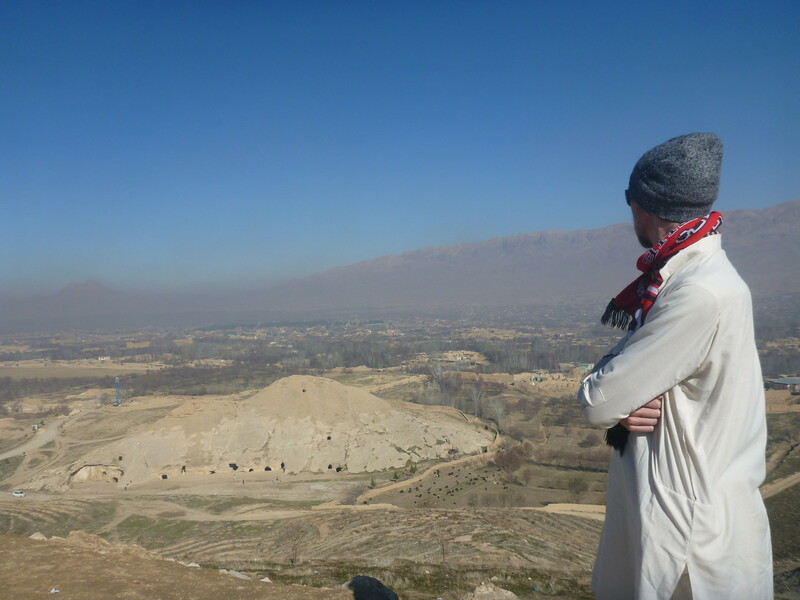 For my other stuff on Afghan check my articles on how to get an Afghanistan visa, how to cross from Uzbekistan into Afghanistan, touring Masar e Sharif, my hotel and homestay experiences , the Mantoo meal and the night on the rip in Masar. Here is a video which actually captures footage of my lob on it, by chance! Thanks for the video Noor and to Reza for sorting out this match. Book your Afghanistan tour with Untamed Borders but be prepared for an emotional ride. This entry was posted in Afghanistan, Central Asia/Middle East, Football, Haibak, Samangan, Sports, The Day I. Bookmark the permalink. The security situation in Afghanistan is extremely unstable, and the threat to all U.S. citizens in Afghanistan remains critical. This Travel Warning supersedes the Travel Warning for Afghanistan issued on May 22, 2015. The U.S. government remains highly concerned about possible attacks on U.S. citizens (whether visiting or residing in Afghanistan), U.S. facilities, businesses, and perceived U.S. and foreign interests. 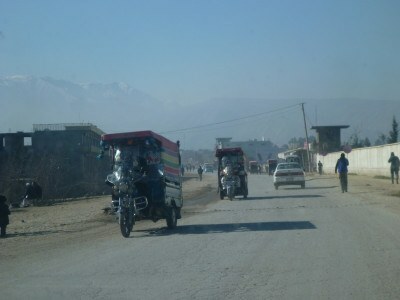 Attacks may target official government convoys and compounds, including Afghan and U.S. government facilities, foreign embassies and military installations, as well as restaurants, hotels, airports, non-governmental organization (NGO) offices, international organizations, religious institutions, educational centers, foreign guest houses, and other commercial entities. 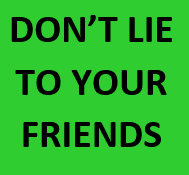 I totally get what you mean, my friend! While I have had my fair share of impromptu footy matches over the years, the one that sticks out of my mind the most was the day my friend and I got to play with some Kechi Mayan children in Southern Belize. Much like Afghanistan, Southern Belize gets very few visitors and this Kechi Mayan village was an extremely impoverished community. We were only there for one night, yet, I was touched by their sense of joy and enthusiasm playing some football with us despite the apparent poverty they lived in. As we left the village the next day, I knew we would never come back here again. My only hope was that they would get more visitors in the future so the village could have a little more to survive on. 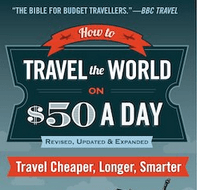 But, it’s a delicate balance between staying true to your cultural practices and embracing tourism dollars. Whereas in your case, having peace and stability for these Afghani children is the ultimate goal. 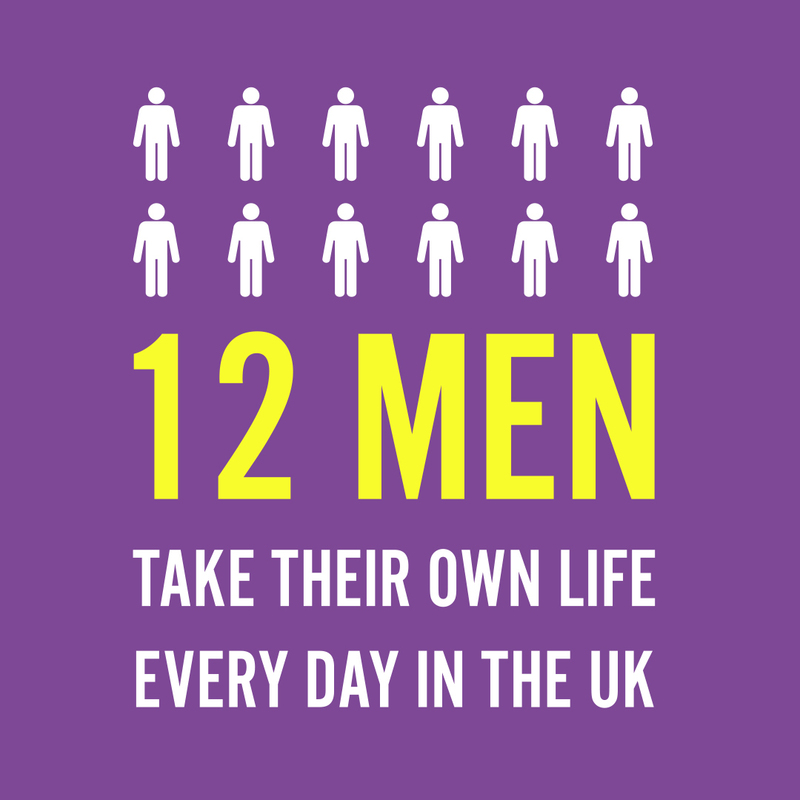 I know both of us had slightly different experiences, but how couldn’t you be emotionally impacted by this, right?